Louis Wain | Napsbury, People | Out of Sight, Out of Mind? Out of Sight, Out of Mind? Louis Wain (1860 – 1939) was an English artist famous for his paintings of cats. He is also one of the best known patients of Napsbury Hospital, which was in London Colney. The hospital was one of several asylums established south of St Albans in the late nineteenth century. From the 1880s to 1914, Wain was a prolific popular artist whose paintings of cats made him a household name. The First World War destroyed the market for Wain’s work, and he lost his savings and suffered a series of personal misfortunes. He was declared insane in 1923, and was transferred to the pauper’s ward of the Springfield Hospital, Tooting, which was the location of the Surrey County Mental Asylum. Here he was diagnosed as suffering from schizophrenia. When the circumstances of this once famous artist became known, a group of influential people set up the Louis Wain fund in 1925, and the appeal was supported by the Prime Minister of the day, Ramsay MacDonald. This lead to Wain being transferred to the Royal Bethlem Hospital in Southwark in 1930, but when the hospital moved to Beckenham in South London, it was decided that it would be better to transfer Wain to the Middlesex County Asylum at Napsbury in 1930, by which time he was 70. He would stay at Napsbury until his death in 1939. Louis Wain continued to draw and paint during his time in hospital, with his sisters bringing his artist’s materials and collecting any finished works to sell. St Albans Museums hold two of his paintings, seen here. 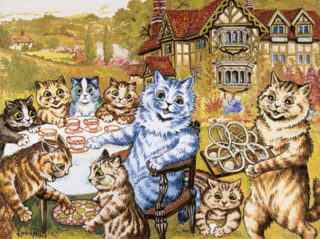 ‘A Tea Party at Napsbury’ was one of the works he produced while living at Napsbury and combines themes he used continually in his works of this period: cats; a tea party; the prospect of tennis; and a mock-Tudor house. Like much of his last work, it is in vivid colours. 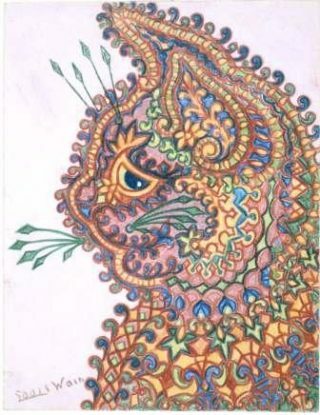 Though Louis Wain’s work fell out of fashion, interest was revived in the late 1960s with the publication of Rodney Dale’s biography Louis Wain: The Man who Drew Cats, and also by an exhibition of his work at the Victoria and Albert Museum in 1972. Since then his work has become highly collectible. Some people in St Albans still have memories of Louis Wain during his time at Napsbury. If you have any memories you would like to share, please feel free to add your comments below. This page was added on 03/11/2009. Napsbury Military Hospital, Ward M6, WW1. 19/08/1917 to 28/09/1917.